Das eine oder andere Clubmitglied ist auch dem Golfsport verfallen. Daher gibt es hier eine Rubrik, in der wir in unregelmäßigen Abständen über Erlebnisse, Events und Aktivitäten rund um Golf berichten. Here are the original rules of Golf, as written by the Honorable Company of Edinburgh Golfers in 1744. You must tee your ball within a club’s length of the hole. Your tee must be on the ground. You are not to change the ball which you strike off the tee. 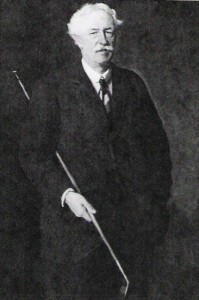 You are not to remove stones, bones or any break club for the sake of playing your ball, except upon the fair green, and that only within a club’s length of the ball. If your ball comes among watter, or any wattery filth, you are at liberty to take out your ball and bringing it behind the hazard and teeing it, you may play it with any club and allow your adversary a stroke for so getting out your ball. If your balls be found anywhere touching one another you are to lift the first ball till you play the last. At holling you are to play your ball honestly at the hole, and not to play upon your adversary’s ball, not lying in your way to the hole. If you should lose your ball, by its being taken up, or any other way, you are to go back to the spot where you struck last and drop another ball and allow your adversary a stroke for the misfortune. No man at holling his ball is to be allowed to mark his way to the hole with his club or anything else. If a ball be stopp’d by any person, horse, dog, or any thing else, the ball so stopp’d must be played where it lyes. If you draw your club in order to strike and proceed so far in the stroke as to be bringing down your club, if then your club should break in any way, it is to be accounted a stroke. He whose ball lyes farthest from the hole is obliged to play first. Neither trench, ditch, or dyke made for the preservation of the links, nor the Scholar’s Holes or the soldier’s lines shall be accounted a hazard but the ball is to be taken out, teed and play’d with any iron club. 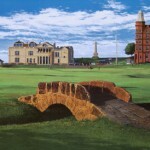 NOTE : The „Scholar’s Holes and „Soldier’s Lines“ were seemingly hazards relating to the links course at Leith, but were included with St Andrews rules. Copyright © 2019 The Islay Whisky Chapter Austria. All Rights Reserved.